Yesterday Metrolinx affirmed its plan to build a rail link to the airport. But they weren’t endorsing the Blue 22, the private airport train that will run through Weston. Metrolinx will be building competing train line: a light rail link to Pearson. Metrolinx’s “Big 5” program will complete 5 major transit projects over the next 10 years. One of these is the Eglinton Crosstown LRT, which will run from Scarborough to the airport. The line will be high capacity (about 5000 passengers an hour), frequent (every 3–6 minutes) and cheap ($3 or so). 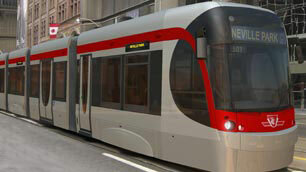 Light rail isn’t the same as rail-rail; it’s more like a subway crossed with a streetcar. The LRT will make connections to the Yonge and University subway and to the proposed Jane St LRT. Thus it will serve the same locations as the Blue 22, if less directly. It will also be quite fast, especially for travellers heading midtown and not to Union. For $3, the Eg train will get you to the Yonge subway station in 48 minutes. In contrast, the Blue 22 would save 19 minutes but cost $20 more. Both will be fast, frequent, and comfortable. But only the Eglinton LRT is cheap, connects directly with the subway, and takes riders midtown. The private nature of the Blue 22 may yet be its undoing; the Eglinton LRT is the better way. Unfortunately, as of last week, Metrolinx put the halt on being able to ‘ride the rails’ from east to west out to the airport. The LRT is now only scheduled to go from Laird which is in Leaside to Jane Street. Essentially, the service will provide no service if you live either east or west of the junction points. And the area of Toronto that is already well serviced by TTC will have enhanced service while us plebes in the east and west ends will have to make do. And if you thought you would be able to LRT it to the airport, think again — you’ll have to either go down to Union Station to hop on for about $30 (we still have our doubts about our stop in Weston and the price) or go to Kipling St. to take the bus or drive. Lots of excuses but no good answers as to why Metrolinx has done this after all the hoopla about Transit City. Maybe they are afraid that competition will diminish the desire to overpay for a ride to Pearson? Who knows? We just keep asking questions….